We may be experiencing a golden age of television right now, but the original golden age of TV is still pretty mesmerizing. And fewer shows captured audiences quite like I Love Lucy. In a recently recirculated video, we get a color glimpse at the iconic program. How? Someone snuck in a 8mm color video camera to the October 12, 1951 taping! How very clandestine. Forever one of the best shows of all time. Lucille Ball’s comedic timing was effortless and women like her are the real feminists, proving that she could stand toe to toe with any man, in a time where women really were regarded as inferior. She was the first women to head a Hollywood Studio, Desilu. That studio produced both Star Trek and Mission Impossible. She was brilliant. Desilu also produced one of the all time classic gangster series, The Untouchables. Ironically the narrator, Walter Winchell, exposed Lucy’s family as communist sympathizers that almost caused that show to be snatched off the air. The only reason it wasn’t was because it was too popular with the public (and CBS was in no way going to let it go quietly). If you have the Hallmark Channel you can watch them prepare to go out west, get arrested in Tennessee, their arrival in Ethel’s home town (Albuquerque) and finally arrive in Hollywood this week starting Tuesday morning. For me this is the funniest show ever. Laugh out loud funny. Golden Girls is probably second. Even tho this isn’t a gay topic I think it should be here. The four cast members of ILLucy, are perfect and the later show without Fred and Ricky just don’t do it for me. I also enjoy Dottie Gets Spanked, which is a short film about Todd Hayne’s childhood memories of actually going to the set of ILLucy, winning a contest and meeting her, and how different she was in real life. The first season of THE LUCY SHOW (the one in black and white) is actually pretty great. 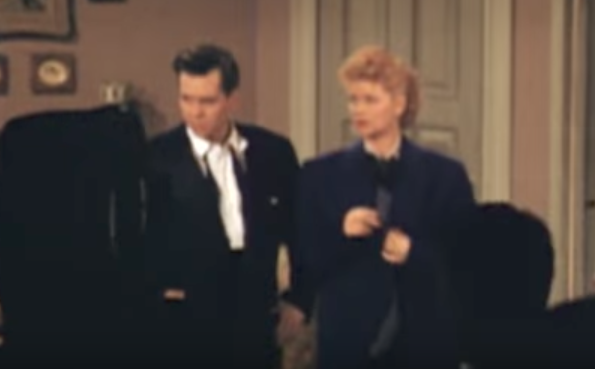 It was written by the same team of I LOVE LUCY writers and features several classic Lucy and Viv bits (putting up a TV antenna, installing a shower, building a rumpus room) and I love the Christmas episode which addresses the different ways people celebrate Christmas … with comically disastrous results. Didn’t a flash go off? Guess there was no flash. It’ hard to judge the choice or taste of the color pallete on the Lucy stage as it appears in this color footage. It was painted this way because certain colors pop differently on black and white film. Film crew members used to wear red lensed glases to help them cordinate color combonations so that they produced better harmonious contrasts in black and white. The color asthetics from the mid 20th century I think is better showed from technicolor films and Better Homes and Gardens magazines. Sounds fishy. 8mms are loud. Gale Storm did every comedic thing Lucille Ball did, and she did it first. See “My Little Margie” on youtube. Amazed that he could sneak that camera in. I thought cameras back then were very large and had big lights on them. Cool none the less.